Seven humans and one dog attended the first Seattle area BlueHackers Meetup. Through a “guided conversation” attendees discussed their own struggles and successes with ADHD, Asperger’s, depression, self harm, and trauma. 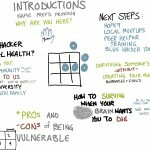 elaborated the ‘why’ of Blue Hackers–the need and benefit of identifying mental health issues openly in hacker/maker culture. entertained some pros and cons of vulnerability. We ran out of time to talk about surviving someone else’s crisis without making one of your own. And we decided another meetup would be grand. To that end, the next Seattle Blue Hackers meet up will be Sunday, March 11th, from 4 to 6pm (come and go as you need to). Location: Jigsaw Renaissace, 815 S Seattle Blvd, Seattle WA 98134. For more info on this meetup, email robin (at) jigsawrenaissance dot org.